Owing to circumstances beyond my control - birthdays and that sort of thing - it was required, as the textbooks have it, to provide my wife with a brand new perfectly good gentleman's mountain bicycle, and natch I took her old one, wot she'd mistakenly thought I'd bought for her and wot, therefore, I'd been unable thus far to ride, up to the shop to see what would fit. Her views being irrelevant the purchase was effected, but nevertheless she was dead pleased to find herself the owner of a 29er. 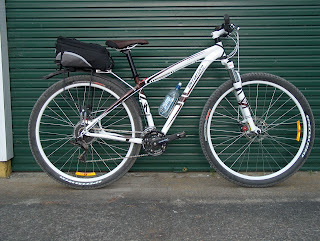 A rear rack and boxy thing got fitted, to the great mirth of all the young athletes who eschew such ungainly protuberances and who themselves spray bananas and energy bars and spare inner tubes out of their jersey pockets whenever the bumps are too exuberant. 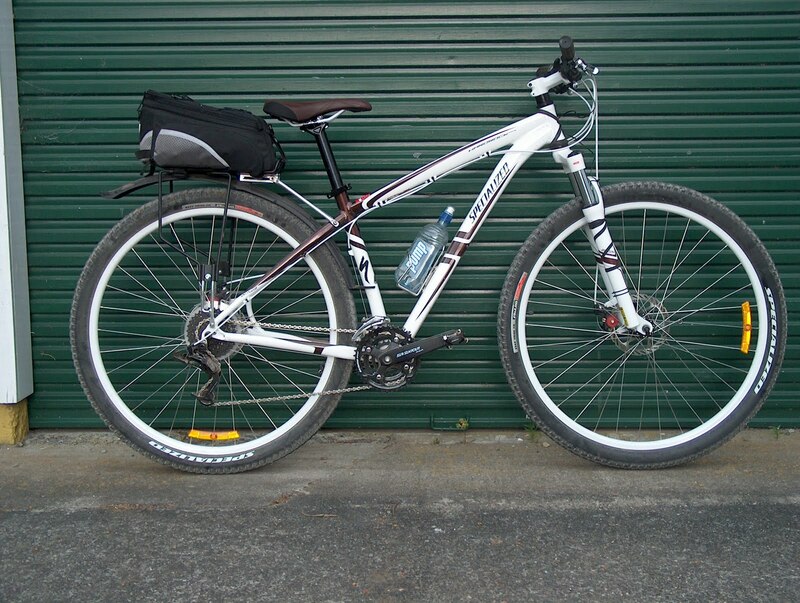 Mrs My Wife has got herself a Specialized somethingorother 29er mountain bike wherewith she's much pleased. It was very cheap. About a thousand dollars. 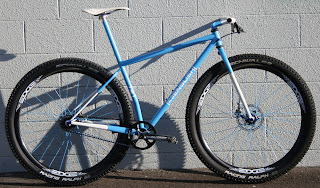 New Zealand ones .The bike shop boys were babbling about tubeless tyres and how their rolling resistance would be vastly superior and whatnot, so I want an informed opinion. Easy to fit? Rubber rim liner better than plastic? Tube sealer works sealing punctures? Lower pressure equivalent to higher pressure for rolling resistance on-road? Any other issues? I have used tubeless mtb tyres quite a lot. Sometimes I can get them to seat with very rapid use of a track pump, but sometimes it requires a compressor. But once seated with sealant in, they work very well. Unless you don't ride the bike much in which case the sealant dries up into a big puddle of latex in the bottom of the tyre. I wouldn't consider racing without them (no pinch punctures, nice low pressure (20lbs), other punctures seal up), but I don't mountain bike enough these days to bother the rest of the time. I haven't yet tried road tubeless, but reports are good so far, and in theory they should offer superior rolling resistance, but I haven't actually seen any data yet. For sealing the rims on the mtbs I just use NoTubes yellow tape - very light and does the job. Their rubber rim strips work nicely too, though a bit heavy and I also seem to eventually rip the valve stems out of them. We did a 10 mile ride on the new tandem t'other day and it felt better and better as we went along. Drivetrain is very nice and quiet and smooth. A little bit of wag in the back, so I am going to increase the lower connector tube to 1.5" before I paint it. The titanium tubes there do really take the edge off of the bumps though. 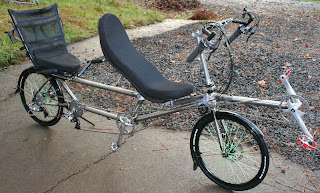 I keep meaning to build a recumbent tandem myself but unf. 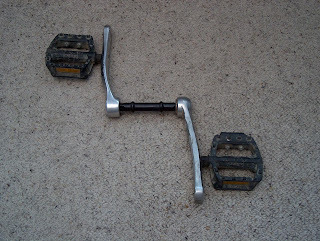 I'd recently secreted two cranks in the car of Mr Schroder of our colony of Stoke-or-Richmond-or- Nelson-or-somewhere, and the other day he couriered them back to me rather neatly drilled and tapped at 110mm and now I can't think of an excuse not to build a front-wheel-drive 29er of some sort, which, with these cranks, will be sort of like a 45 inch gear fixie. If I've got the sums right. Which isn't usually the case.